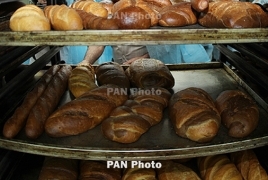 PanARMENIAN.Net - With the support of Business Armenia, Golden Bakery has established an eastern bread factory in Armenia. “We will invest another $150,000 during the next 3 years. We also aim to export our bakery products to Georgia," noted Sevan Artin, the CEO of Golden Bakery. "In addition to making mutually beneficial deals, we are also interested in increasing the wave of investment in Armenia," added Garen Mikirditsian, the founder of Rivera Capital.